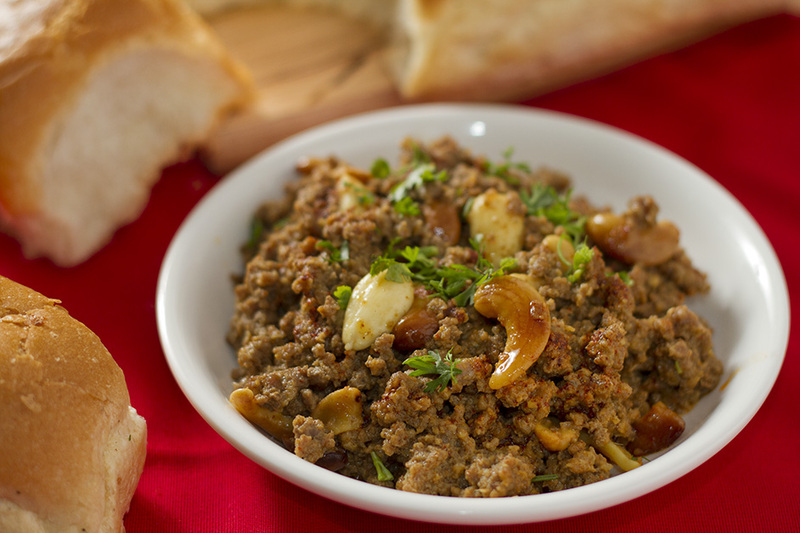 Kheema Shahzada, the prince of all mince mutton dishes is a fragrant, flavourful dish with toppings of Cashew nuts and Almonds. While the meat of lamb is best to make this dish, you can substitute it with the mince meat of Beef, Chicken or Turkey too. Kheema got elevated to a gourmet status during the Mughal rule. It is said that the Emperors, Kings and Nawabs that ruled India were very fond of good food and several dishes were invented by the Indian Khansamas (Chefs) to suit the pallets of these rulers and Nawabs. These are very dishes that we now enjoy. Invasions, regular trade with other countries and colonialism have played a large part in the development of Indian Cuisine, and one of the main reason for the richness of North Indian Mughlai delicacies is combining of Afghani, Persian, Turki, Kashmiri and the local (Indian) herbs, spices and fruits into the dishes prepared. In a pan, melt ghee and fry onions, ginger and garlic till onions change colour. Squeeze the fat out, remove them and puree it along with milk and keep aside. Add the remaining ghee, and fry all the ground ingredients and ground turmeric. Add the poppy seed mixture a bit later and fry for about about 2 mins. Keep sprinkling water so that the ingredients do not stick to the bottom of the pan. Add the mince to the pan and fry until all the liquid evaporates (about 10 minutes), stirring frequently. Take care that nothing sticks to the bottom of the pan. Add the salt, cashews and the water, bring to the boil, cover the pan and cook over low heat for about 15 minutes stirring occasionally. By now the mince would be cooked. If not, let it cook completely. After the mince is cooked through, add the pureed mixture of onion, ginger garlic and milk to the mince, stir and let the meat absorb the mixture. Put the mince onto a serving dish and garnish with coriander leaves and serve with Pav or any Indian flat bread. Mughlai cuisine is a style of cooking developed in South Asia by the imperial kitchens of the Muslim Mughal Empire. It represents the cooking styles used in North India (especially Uttar Pradesh and Delhi), Pakistan,and the Indian city of Hyderabad. The cuisine is strongly influenced by the Central Asian cuisine, the region where the Chagatai-Turkic Mughal rulers originally hailed from, and it has in turn strongly influenced the regional cuisines of Kashmir and the Punjab region. Mughlai cuisine is the foundation of Pakistani cuisine including Cuisine of Karachi. The tastes of Mughlai cuisine vary from extremely mild to spicy, and is often associated with a distinctive aroma and the taste of ground and whole spices. A Mughlai course is an elaborate buffet of main course dishes with a variety of accompaniments. The official adopted language of the Mughal Empire was Persian, so many Indian dishes were named in Persian language. Dishes include various kebabs, kofta (meatballs), nihari, pulao (a.k.a. pilaf in Central Asia), and biryani.